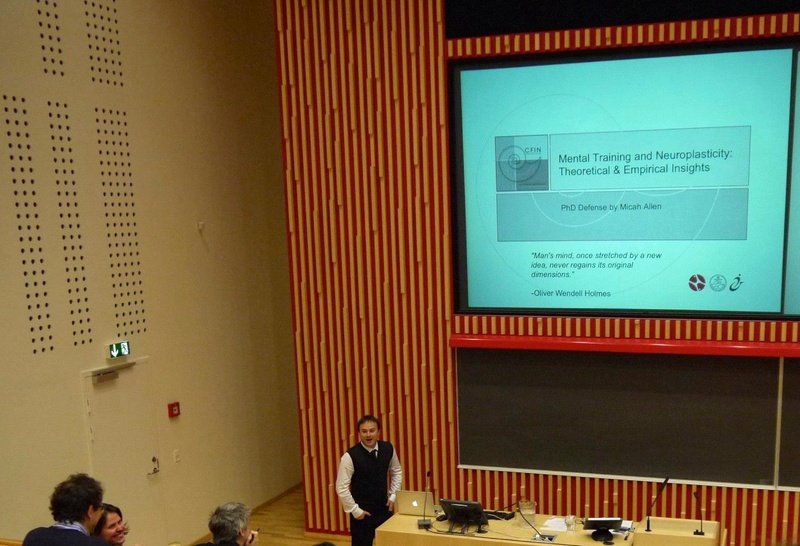 Mindfulness and neuroplasticity – summary of my recent paper. First, let me apologize for an overlong hiatus from blogging. I submitted my PhD thesis October 1st, and it turns out that writing two papers and a thesis in the space of about three months can seriously burn out the old muse. I’ve coaxed her back through gentle offerings of chocolate, caffeine, and a bit of videogame binging. As long as I promise not to bring her within a mile of a dissertation, I believe we’re good for at least a few posts per month. 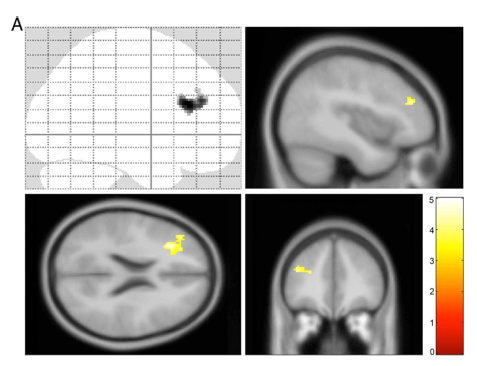 With that taken care of, I am very happy to report the successful publication of my first fMRI paper, published last month in the Journal of Neuroscience. The paper was truly a labor of love taking nearly 3 years to complete and countless hours of head-scratching work. In the end I am quite happy with the finished product, and I do believe my colleagues and I managed to produce a useful result for the field of mindfulness training and neuroplasticity. note: this post ended up being quite long. if you are already familiar with mindfulness research, you may want to skip ahead! First, depending on what brought you here, you may already be wondering why mindfulness is an interesting subject, particularly for a cognitive neuroscientist. In light of the large gaps regarding our understanding of the neurobiological foundations of neuroimaging, is it really the right time to apply these complex tools to meditation? Can we really learn anything about something as potentially ambiguous as “mindfulness”? Although we have a long way to go, and these are certainly fair questions, I do believe that the study of meditation has a lot to contribute to our understanding of cognition and plasticity. 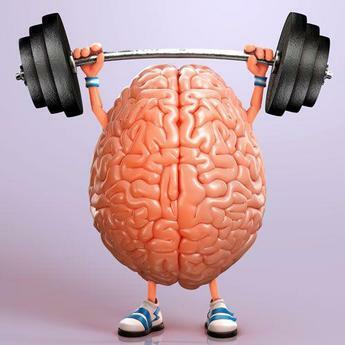 Generally speaking, when you want to investigate some cognitive phenomena, a firm understanding of your target is essential to successful neuroimaging. Areas with years of behavioral research and concrete theoretical models make for excellent imaging subjects, as in these cases a researcher can hope to fall back on a sort of ‘ground truth’ to guide them through the neural data, which are notoriously ambiguous and difficult to interpret. Of course well-travelled roads also have their disadvantages, sometimes providing a misleading sense of security, or at least being a bit dry. While mindfulness research still has a ways to go, our understanding of these practices is rapidly evolving. At this point it helps to stop and ask, what is meditation (and by extension, mindfulness)? The first thing to clarify is that there is no such thing as “meditation”- rather meditation is really term describing a family resemblance of highly varied practices, covering an array of both spiritual and secular practices. Meditation or “contemplative” practices have existed for more than a thousand years and are found in nearly every spiritual tradition. More recently, here in the west our unending fascination of the esoteric has lead to a popular rise in Yoga, Tai Chi, and other physically oriented contemplative practices, all of which incorporate an element of meditation. At the simplest level of description [mindfulness] meditation is just a process of becoming aware, whether through actual sitting meditation, exercise, or daily rituals. Meditation (as a practice) was first popularized in the west during the rise of transcendental meditation (TM). As you can see in the figure below, interest in TM lead to an early boom in research articles. This boom was not to last, as it was gradually realized that much of this initially promising research was actually the product of zealous insiders, conducted with poor controls and in some cases outright data fabrication. As TM became known as a cult, meditation research underwent a dark age where publishing on the topic could seriously damage a research career. We can see also that around the 1990’s, this trend started to reverse as a new generation of researchers began investigating “mindfulness” meditation. It’s easy to see from the above why when Jon Kabat-Zinn re-introduced meditation to the West, he relied heavily on the medical community to develop a totally secularized intervention-oriented version of meditation strategically called “mindfulness-based stress reduction.” The arrival of MBSR was closely related to the development of mindfulness-based cognitive therapy (MBCT), a revision of cognitive-behavioral therapy utilizing mindful practices and instruction for a variety of clinical applications. Mindfulness practice is typically described as involving at least two practices; focused attention (FA) and open monitoring (OM). FA can be described as simply noticing when attention wanders from a target (the breath, the body, or a flower for example) and gently redirecting it back to that target. OM is typically (but not always) trained at an later stage, building on the attentional skills developed in FA practice to gradually develop a sense of “non-judgmental open awareness”. While a great deal of work remains to be done, initial cognitive-behavioral and clinical research on mindfulness training (MT) has shown that these practices can improve the allocation of attentional resources, reduce physiological stress, and improve emotional well-being. In the clinic MT appears to effectively improve symptoms on a variety of pathological syndromes including anxiety and depression, at least as well as standard CBT or pharmacological treatments. Has the quality of research on meditation improved since the dark days of TM? When answering this question it is important to note two things about the state of current mindfulness research. First, while it is true that many who research MT are also practitioners, the primary scholars are researchers who started in classical areas (emotion, clinical psychiatry, cognitive neuroscience) and gradually became involved in MT research. Further, most funding today for MT research comes not from shady religious institutions, but from well-established funding bodies such as the National Institute of Health and European Research Council. It is of course important to be aware of the impact prior beliefs can have on conducting impartial research, but with respect to today’s meditation and mindfulness researchers, I believe that most if not all of the work being done is honest, quality research. However, it is true that much of the early MT research is flawed on several levels. Indeed several meta-analyses have concluded that generally speaking, studies of MT have often utilized poor design – in one major review only 8/22 studies met criteria for meta-analysis. The reason for this is quite simple- in the absence of pilot data, investigators had to begin somewhere. Typically it doesn’t bode well to jump into unexplored territory with an expensive, large sample, fully randomized design. There just isn’t enough to go off of- how would you know which kind of process to even measure? Accordingly, the large majority of mindfulness research to date has utilized small-scale, often sub-optimal experimental design, sacrificing experimental control in order build a basic idea of the cognitive landscape. While this exploratory research provides a needed foundation for generating likely hypotheses, it is also difficult to make any strong conclusions so long as methodological issues remain. Indeed, most of what we know about these mindfulness and neuroplasticity comes from studies of either advanced practitioners (compared to controls) or “wait-list” control studies where controls receive no intervention. On the basis of the findings from these studies, we had some idea how to target our investigation, but there remained a nagging feeling of uncertainty. Just how much of the literature would actually replicate? Does mindfulness alter attention through mere expectation and motivation biases (i.e. placebo-like confounds), or can MT actually drive functionally relevant attentional and emotional neuroplasticity, even when controlling for these confounds? Research to date links mindfulness practices to alterations in health and physiology, cognitive control, emotional regulation, responsiveness to pain, and a large array of positive clinical outcomes. However, the explicit nature of mindfulness training makes for some particularly difficult methodological issues. Group cross-sectional studies, where advanced practitioners are compared to age-matched controls, cannot provide causal evidence. Indeed, it is always possible that having a big fancy brain makes you more likely to spend many years meditating, and not that meditating gives you a big fancy brain. So training studies are essential to verifying the claim that mindfulness actually leads to interesting kinds of plasticity. However, unlike with a new drug study or computerized intervention, you cannot simply provide a sugar pill to the control group. Double-blind design is impossible; by definition subjects will know they are receiving mindfulness. To actually assess the impact of MT on neural activity and behavior, we need to compare to groups doing relatively equivalent things in similar experimental contexts. We need an active control. There is already a well-established link between measurement outcome and experimental demands. What is perhaps less appreciated is that cognitive measures, particularly reaction time, are easily biased by phenomena like the Hawthorne effect, where the amount of attention participants receive directly contributes to experimental outcome. Wait-lists simply cannot overcome these difficulties. We know for example, that simply paying controls a moderate performance-based financial reward can erase attentional reaction-time differences. If you are repeatedly told you’re training attention, then come experiment time you are likely expect this to be true and try harder than someone who has received no such instruction. The same is true of emotional tasks; subjects told frequently they are training compassion are likely to spend more time fixating on emotional stimuli, leading to inflated self-reports and responses. I’m sure you can quickly see how it is extremely important to control for these factors if we are to isolate and understand the mechanisms important for mindfulness training. One key solution is active-control, that is providing both groups (MT and control) with a “treatment” that is at least nominally as efficacious as the thing you are interested in. Active-control allows you exclude numerous factors from your outcome, potentially including the role of social support, expectation, and experimental demands. This is exactly what we set out to do in our study, where we recruited 60 meditation-naïve subjects, scanned them on an fMRI task, randomized them to either six weeks of MT or active-control, and then measured everything again. Further, to exclude confounds relating to social interaction, we came up with a particularly unique control activity- reading Emma together. To overcome these confounds, we constructed a specialized control intervention. As it was crucial that both groups believed in their training, we needed an instructor who could match the high level of enthusiasm and experience found in our meditation instructors. We were lucky to have the help of local scholar Mette Stineberg, who suggested a customized “shared reading” group to fit our purposes. Reading groups are a fun, attention demanding exercise, with purported benefits for stress and well-being. While these claims have not been explicitly tested, what mattered most was that Mette clearly believed in their efficacy- making for a perfect control instructor. Mette holds a PhD in literature, and we knew that her 10 years of experience participating in and leading these groups would help us to exclude instructor variables from our results. With her help, we constructed a special condition where participants completed group readings of Jane Austin’s Emma. A sensible question to ask at this point is – “why Emma?” An essential element of active control is variable isolation, or balancing your groups in such way that, with the exception of your hypothesized “active ingredient”, the two interventions are extremely similar. As MT is thought to depend on a particular kind of non-judgmental, interoceptive kind of attention, Chris and Uta Frith suggested during an early meeting that Emma might be a perfect contrast. For those of you who haven’t read the novel, the plot is brimming over with judgment-heavy theory-of-mind-type exposition. Mette further helped to ensure a contrast with MT by emphasizing discussion sessions focused on character motives. In this way we were able to ensure that both groups met for the same amount of time each week, with equivalently talented and passionate instructors, and felt that they were working towards something worthwhile. Finally, we made sure to let every participant know at recruitment that they would receive one of two treatments intended to improve attention and well-being, and that any benefits would depend upon their commitment to the practice. To help them practice at home, we created 20-minute long CD’s for both groups, one with a guided meditation and the other with a chapter from Emma. Unlike previous active-controlled studies that typically rely on relaxation training, reading groups depend upon a high level of social-interaction. Reading together allowed us not only to exclude treatment context and expectation from our results, but also more difficult effects of social support (the “making new friends” variable). To measure this, we built a small website for participants to make daily reports of their motivation and minutes practiced that day. 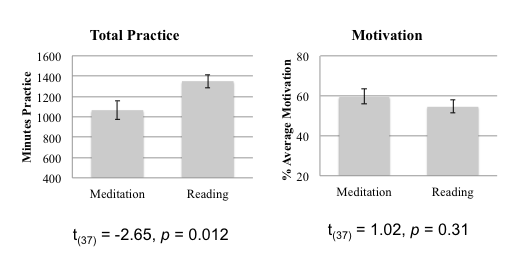 As you can see in the figure below, when we averaged these reports we found that not only did the reading group practice significantly more than those in MT, but that they expressed equivalent levels of motivation to practice. Anecdotally we found that reading-group members expressed a high level of satisfaction with their class, with a sub-group of about 8 even continued their meetings after our study concluded. The meditation group by comparison, did not appear to form any lasting social relationships and did not continue meeting after the study. We were very happy with these results, which suggest that it is very unlikely our results could be explained by unbalanced motivation or expectation. After we established that active control was successful, the first thing to look at was some of our outside-the-scanner behavioral results. 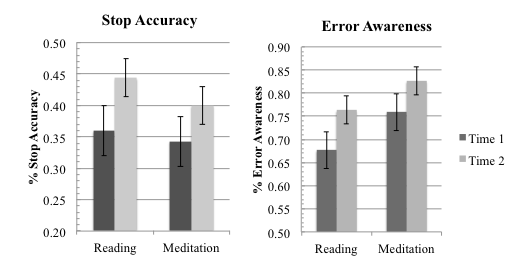 As we were interested in the effect of meditation on both attention and meta-cognition, we used an “error-awareness task” (EAT) to examine improvement in these areas. 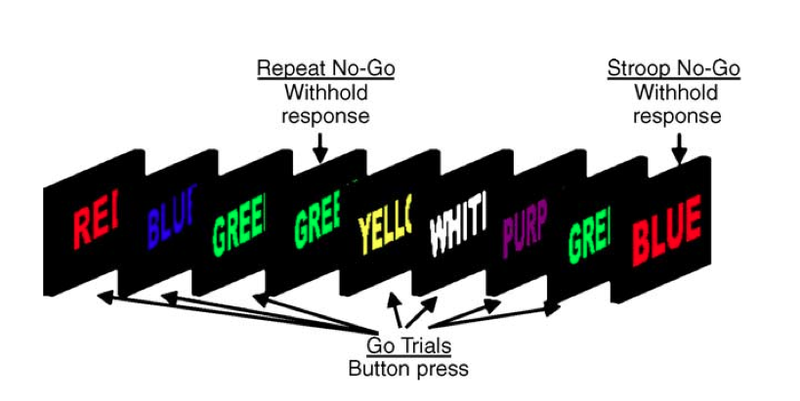 The EAT (shown below) is a typical “go-no/go” task where subjects spend most of their time pressing a button. The difficult part comes whenever a “stop-trial” occurs and subject must quickly halt their response. In the case where the subject fails to stop, they then have the opportunity to “fix” the error by pressing a second button on the trial following the error. If you’ve ever taken this kind of task, you know that it can be frustratingly difficult to stop your finger in time – the response becomes quite habitual. Using the EAT we examined the impact of MT on both controlling responses (a variable called “stop accuracy”), as well as also on meta-cognitive self-monitoring (percent “error-awareness”). Group x time analysis of SA and EA. 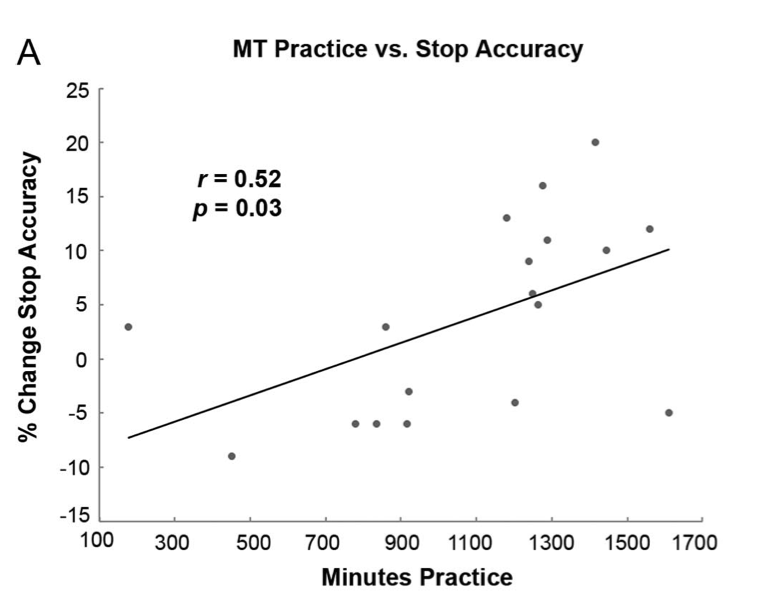 These results lead us to conclude that while we did not observe a treatment effect of MT on the error-awareness task, the presence of strong time effects and MT-only correlation with practice suggested that the improvements within each group may relate to the “active ingredients” of MT but reflect motivation-driven artifacts in the reading group. Sadly we cannot conclude this firmly- we’d have needed to include a third passive control group for comparison. Thankfully this was pointed out to us by a kind reviewer, who noted that this argument is kind of like having one’s cake and eating it, so we’ll restrict ourselves to arguing that the EAT finding serves as a nice validation of the active control- both groups improved on something, and a potential indicator of a stop-related treatment mechanism. While the EAT served as a behavioral measure of basic cognitive processes, we also wanted to examine the neural correlates of attention and emotion, to see how they might respond to mindfulness training in our intervention. For this we partnered with Karina Blair at the National Institute of Mental Health to bring the Affective Stroop task (shown below) to Denmark . The Affective Stroop Task (AST) depends on a basic “number-counting Stroop” to investigate the neural correlates of attention, emotion, and their interaction. To complete the task, your instruction is simply “count the number of numbers in the first display (of numbers), count the number of numbers in the second display, and decide which display had more number of numbers”. As you can see in the trial example above, conflict in the task (trial-type “C”) is driven by incongruence between the Arabic numeral (e.g. “4”) and the numeracy of the display (a display of 5 “4”’s). Meanwhile, each trial has nasty or neutral emotional stimuli selected from the international affective picture system. Using the AST, we were able to examine the neural correlates of executive attention by contrasting task (B + C > A) and emotion (negative > neutral) trials. Since we were especially interested in changes over time, we expanded on these contrasts to examine increased or decreased neural response between the first and last scans of the study. To do this we relied on two levels of analysis (standard in imaging), where at the “first” or “subject level” we examined differences between the two time points for each condition (task and emotion), within each subject. We then compared these time-related effects (contrast images) between each group using a two-sample t-test with total minutes of practice as a co-variate. To assess the impact of meditation on performing the AST, we examined reaction times in a model with factors group, time, task, and emotion. In this way we were able to examine the impact of MT on neural activity and behavior while controlling for the kinds of artifacts discussed in the previous section. Greater association of prefrontal-insular response to negative emotion and practice. When we put all this together, a pattern began to emerge. Overall it seemed like MT had a relatively clear impact on attention and cognitive control. Practice-correlated increases on EAT stop accuracy, reduced Affective Stroop conflict, and increases in dorsolateral prefrontal cortex responses to task all point towards plasticity at the level of executive function. In contrast our emotion-related findings suggest that alterations in affective processing occurred only in MT participants with the most practice. Given how little we know about the training trajectories of cognitive vs affective skills, we felt that this was a very interesting result. Conclusion: the more you do, the what you get? For us, the first conclusion from all this was that when you control for motivation and a host of other confounds, brief MT appears to primarily train attention-related processes. Secondly, alterations in affective processing seemed to require more practice to emerge. This is interesting both for understanding the neuroscience of training and for the effective application of MT in clinical settings. While a great deal of future research is needed, it is possible that the affective system may be generally more resilient to intervention than attention. It may be the case that altering affective processes depends upon and extends increasing control over executive function. Previous research suggests that attention is largely flexible, amenable to a variety of training regimens of which MT is only one beneficial intervention. However we are also becoming increasingly aware that training attention alone does not seem to directly translate into closely related benefits. As we begin to realize that many societal and health problems cannot be solved through medication or attention-training alone, it becomes clear that techniques to increase emotional function and well-being are crucial for future development. I am reminded of a quote overheard at the Mind & Life Summer Research Institute and attributed to the Dalai Lama. Supposedly when asked about their goal of developing meditation programs in the west, HHDL replied that, what was truly needed in the West was not “cognitive training, as (those in the west) are already too clever. What is needed rather is emotion training, to cultivate a sense of responsibility and compassion”. When we consider falling rates of empathy in medical practitioners and the link to health outcome, I think we do need to explore the role of emotional and embodied skills in supporting a wide-array of functions in cognition and well-being. While emotional development is likely to depend upon executive function, given all the recent failures to show a transfer from training these domains to even closely related ones, I suspect we need to begin including affective processes in our understanding of optimal learning. If these differences hold, then it may be important to reassess our interventions (mindful and otherwise), developing training programs that are customized in terms of the intensity, duration, and content appropriate for any given context. Of course, rather than end on such an inspiring note, I should point out that like any study, ours is not without flaws (you’ll have to read the paper to find out how many 😉 ) and is really just an initial step. We made significant progress in replicating common neural and behavioral effects of MT while controlling for important confounds, but in retrospect the study could have been strengthened by including measures that would better distinguish the precise mechanisms, for example a measure of body awareness or empathy. Another element that struck me was how much I wish we’d had a passive control group, which could have helped flesh out how much of our time effect was instrument reliability versus motivation. As far as I am concerned, the study was a success and I am happy to have done my part to push mindfulness research towards methodological clarity and rigor. In the future I know others will continue this trend and investigate exactly what sorts of practice are needed to alter brain and behavior, and just how these benefits are accomplished. In the near-future, I plan to give mindfulness research a rest. Not that I don’t find it fascinating or worthwhile, but rather because during the course of my PhD I’ve become a bit obsessed with interoception and meta-cognition. At present, it looks like I’ll be spending my first post-doc applying predictive coding and dynamic causal modeling to these processes. With a little luck, I might be able to build a theoretical model that could one day provide novel targets for future intervention! Thanks to all the collaborators and colleagues who made this study possible. Mindfulness meditation is a set of attention-based, regulatory and self-inquiry training regimes. Although the impact of mindfulness meditation training (MT) on self-regulation is well established, the neural mechanisms supporting such plasticity are poorly understood. MT is thought to act on attention through bottom-up salience and top-down control mechanisms, but until now conflicting evidence from behavioral and neural measures has made it difficult to distinguish the role of these mechanisms. To resolve this question we conducted a fully randomized 6-week longitudinal trial of MT, explicitly controlling for cognitive and treatment effects. We measured behavioral metacognition and whole-brain BOLD signals during an affective Stroop task before and after intervention. 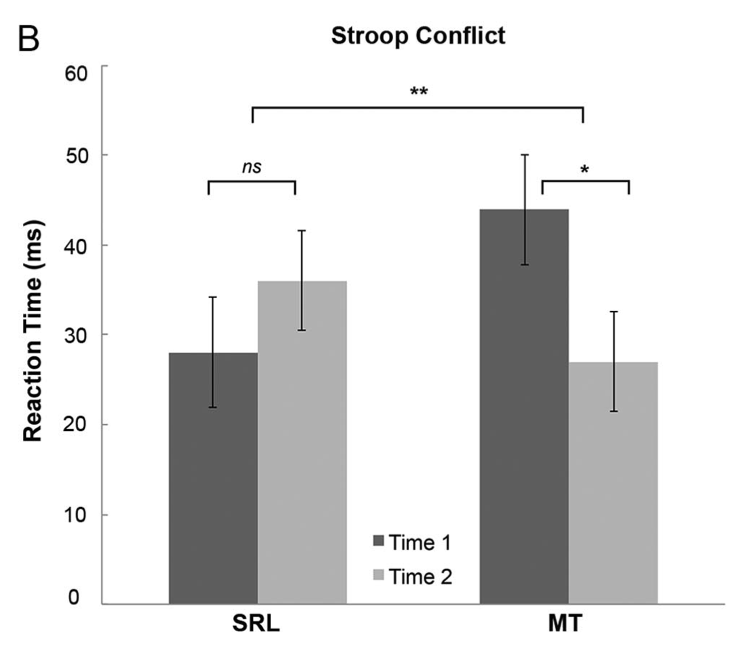 Although both groups improved significantly on a response-inhibition task, only the MT group showed reduced affective Stroop conflict. Moreover, the MT group showed greater dorsolateral prefrontal cortex (DLPFC) responses during executive processing, indicating increased recruitment of top-down mechanisms to resolve conflict. 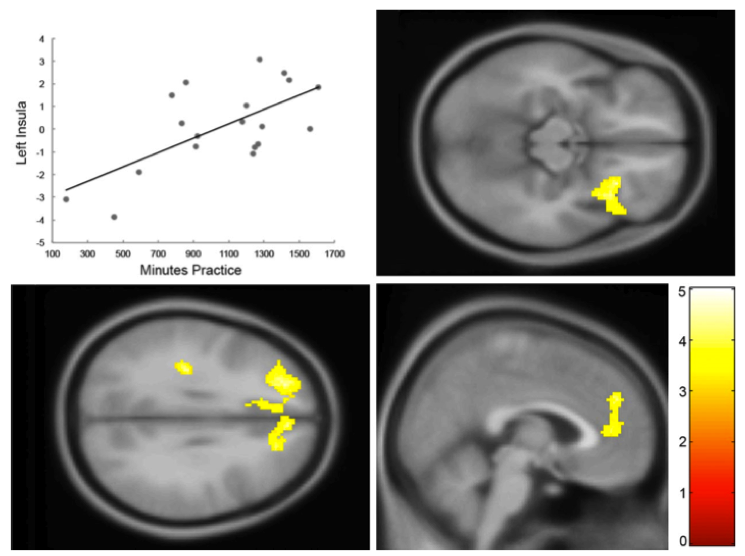 Individual differences in MT adherence predicted improvements in response-inhibition and increased recruitment of dorsal anterior cingulate cortex (dACC), medial prefrontal cortex (mPFC), and right anterior insula during negative valence processing, suggesting that rigorous mindfulness practice precedes alterations of bottom-up processes. 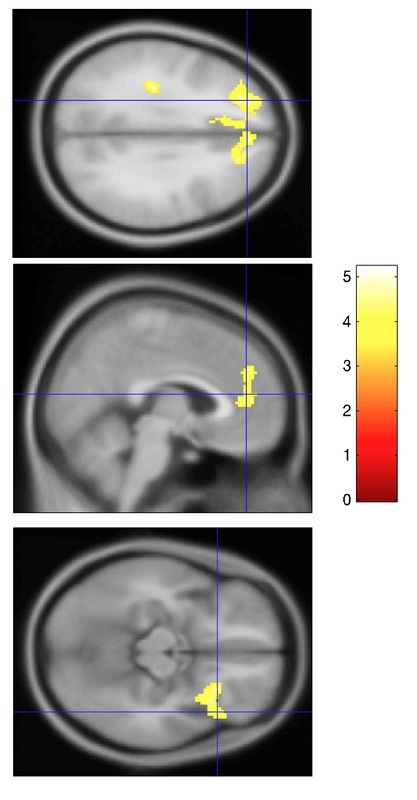 Figure 5, Greater levels of meditation practice predict increased dorsolateral prefrontal, right anterior insula, and medial-prefrontal BOLD recruitment during negative > neutral trials. pFWE < 0.05 corrected on cluster level, voxel selection threshold p = 0.001. Things are fantastic, especially since I’ve moved to London. The ICN is a great place for cognitive neuroscience and I’m learning and doing more than I ever have before. While I prepare this paper, I am simultaneously finishing up a longitudinal VBM analysis of the same data, and beginning to script an eventual 60 subject affective-stroop Dynamic Causal Modeling connectivity study. Everyone here is insanely talented and there is hardly a day that goes by when there isn’t some interesting discussion, a fascinating talk, or an exciting collaboration to be had. disclaimer: these findings have NOT been peer reviewed and as such should not be believed nor reported as science! They’re just pretty pictures for now. Just a quick post to give my review of the latest addition to imaging and mindfulness research. A new article by Kozasa et al, slated to appear in Neuroimage, investigates the neural correlates of attention processing in a standard color-word stroop task. A quick overview of the article reveals it is all quite standard; two groups matched for age, gender, and years of education are administered a standard RT-based (i.e. speeded) fMRI paradigm. One group has an average of 9 years “meditation experience” which is described as “a variety of OM (open monitoring) or FA (focused attention) practices such as “zazen”, mantra meditation, mindfulness of breathing, among others”. We’ll delve into why this description should give us pause for thought in a moment, for now let’s look at the results. In a nutshell, the authors find that meditation-practitioners show faster reaction times with reduced BOLD-signal for the incongruent (compared to congruent and neutral) condition only. The regions found to be more active for non-meditators compared to meditators are the (right) “lentiform nucleus, medial frontal gyrus, and pre-central gyrus” . As this is not accompanied by any difference in accuracy, the authors interpret the finding as demonstrating that “meditators may have maintained the focus in naming the colour with less interference of reading the word and consequently have to exert less effort to monitor the conflict and less adjustment in the motor control of the impulses to choose the correct colour button.” The authors in the conclusion review related findings and mention that differences in age could have contributed to the effect. So, what are we to make of these findings? As is my usual style, I’ll give a bulleted review of the problems that immediately stand out, and then some explanation afterwards. I’ll preface my critique by thanking the authors for their hard work; my comments are intended only for the good of our research community. A simple replication. We like replications! Study claims to “match samples for age” yet no statistical test demonstrating no difference is shown. Qualitatively, the ages seem different enough to be cause for worry (77.8% vs 65% college graduates). Always be suspicious when a test is not given! Extremely sparse description of style of practice, no estimate of daily practice hours given. I’ll preface my conclusion with something Sara Lazar, a meditation researcher and neuroimaging expert at the Harvard MGH told me last summer; we need to stop going for the “low hanging fruit of meditation research”. 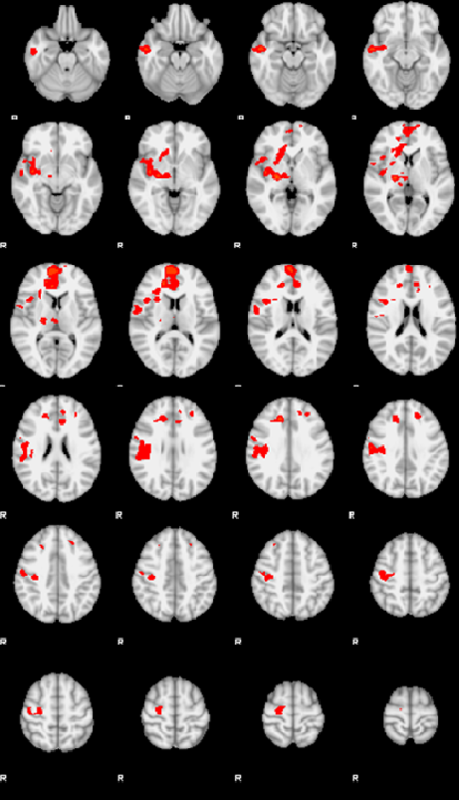 There are now over 20 published cross-sectional reaction-time based fMRI studies of “meditators” and “non-meditators”. Compare that to the incredibly sparse number of longitudinal, active controlled studies, and it is clear that we need to stop replicating these findings and start determining what they actually tell us. Why do we need to active control our meditation studies? For one thing, we know that reaction-time based tests are heavily based by the amount of effort one expends on the task. Effort is in turn influenced by task-demands (e.g. how you treat your participants, expectations surrounding the experiment). To give one in-press example, my colleagues Christian Gaden Jensen at the Copenhagen Neurobiology Research recently conducted a study demonstrating just how strong this confounding effect can be. To briefly summarize, Christian recruited over 150 people for randomization to four experimental groups: mindfulness-based stress reduction (MBSR), non-mindfulness stress reduction (NMSR), wait-listed controls, and financially-motivated wait-listed controls. This last group is the truly interesting one; they were told that if they had top performance on the experimental tasks (a battery of classical reaction-time based and unspeeded perceptual threshold tasks) they’d receive a reward of approximately 100$. When Christian analyzed the data, he found that the financial incentive eliminated all reaction-time based differences between the MBSR, NMSR, and financially motivated groups! It’s important to note that this study, fully randomized and longitudinal, showed something not reflected in the bulk of published studies: that meditation may actually train more basic perceptual sensitivities rather than top-down control. This is exactly why we need to stop pursuing the low-hanging fruit of uncontrolled experimental design; it’s not telling us anything new! 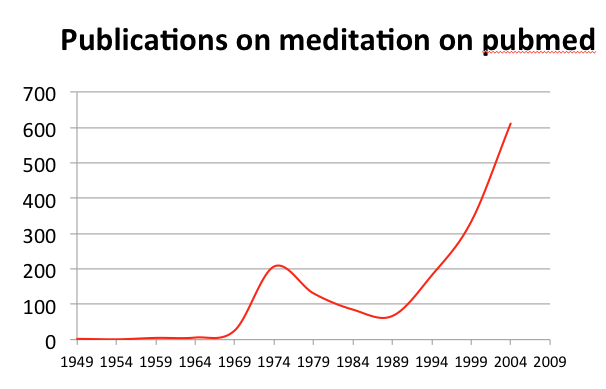 Meditation research is no longer exploratory. In addition to these issues, there is another issue a bit more specific to meditation research. That is the totally sparse description of the practice- less than one sentence total, with no quantitative data! In this study we are not even told what the daily practice actually consists of, or its quality or length. These practitioners report an average of 8 years practice, yet that could be 1 hour per week of mantra meditation or 12 hours a week of non-dual zazen! These are not identical processes and our lack of knowledge for this sample severely limits our ability to assess the meaning of these findings. For the past two years (and probably longer) of the Mind & Life Summer Research Institute, Richard Davidson and others have repeatedly stated that we must move beyond studying meditation as “a loose practice of FA and OM practices including x, y, z, & and other things”. Willoughby Britton suggested at a panel discussion that all meditation papers need to have at least one contemplative scholar on them or risk rejection. It’s clear that this study was most likely not reviewed by anyone with any serious academic background in meditation research. 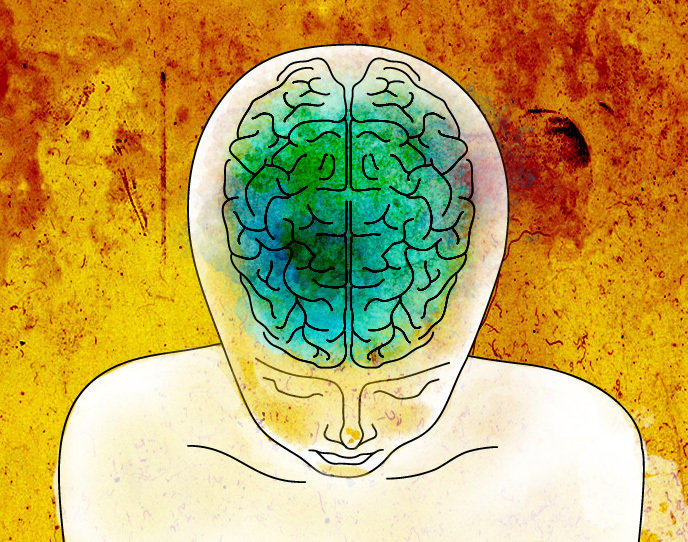 My supervisor Antoine Lutz and his colleague John Dunne, authors of the paper that launched the “FA/OM” distinction, have since stated emphatically that we must go beyond these general labels and start investigating effects of specific meditation practices. To quote John, we need to stop treating meditation like a “black box” if we ever want to understand the actual mechanisms behind it. While I thank the authors of this paper for their earnest contribution, we need to take this moment to be seriously skeptical. We can only start to understand processes like meditation from a scientific point of view if we are willing to hold them to the highest of scientific standards. It’s time for us to start opening the black box and looking inside.